Hello hello! So I said Monday that I had some praises to sing, and boy, do I! It all starts with my very favourite phone app, Instagram. I've been on the app for 101 weeks now, (wow!) and this year I've 'met' some really amazing people through it. Over the last few weeks I've also learnt what a wonderful platform it is for buying hand made, original items that simply are, made with love. So today I have two beautiful things that I want to share with you, that I only know about thanks to the brilliant Instagram community. My first praise to sing is for the lovely Victoria. You can find her on IG as @tangledsweetpea, and do have a nose at her Etsy shop too, where you can buy these gorgeous creations. 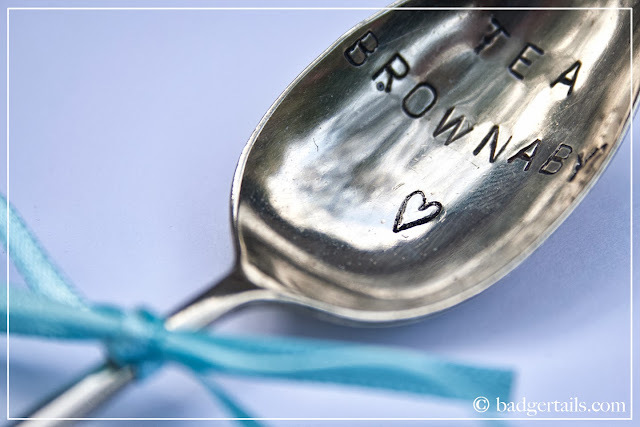 Victoria buys vintage cutlery and hand stamps each piece with a personalised message of your choice. She stocks spoons, butter knives, cake slices and more, all being one-off, antique treasures that are given their own personality with every letter. This is the one that I bought for P as a small Anniversary gift last month. He's a huge tea-lover and this was the perfect quirky item that I knew he'd love. 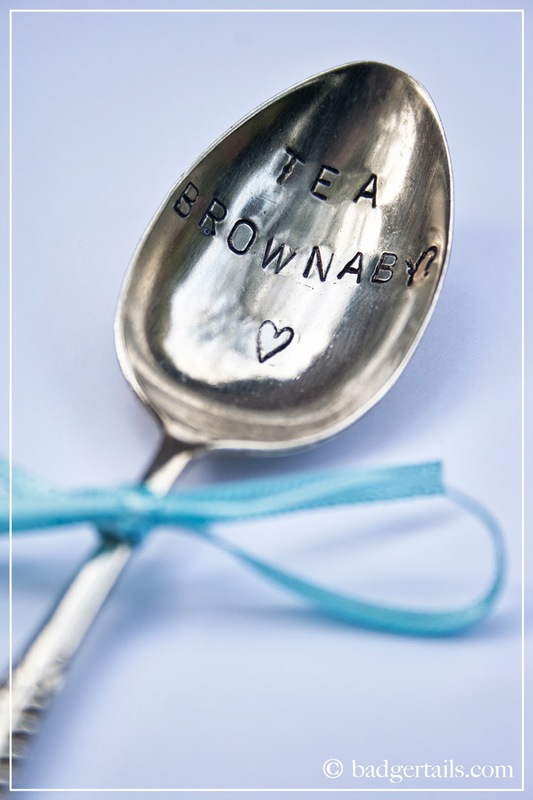 I should probably confirm here that I call him Brownaby, if you were wondering! Victoria finishes each piece off with a dainty satin bow and posts them out to you in lovely packaging, too. She is a pleasure to buy from, her creations are a pleasure to receive, and are even more of a pleasure to give to someone you love. I had rather a few questions to ask before placing my order, and Victoria replied helpfully and promptly. She was quick to make and send my order, and I received it within a couple of days. I honestly recommend her shop if you are looking for something a little bit different, but a big bit special! We both thought this was a little bit too lovely to use, (plus we'd have to remove that sweet bow) so we've decided to frame it. I'm still working out the processes of how to achieve what we want but once we get there you can be sure to see it on here! Each item is priceless, original and guaranteed to bring a smile to anyone's face. 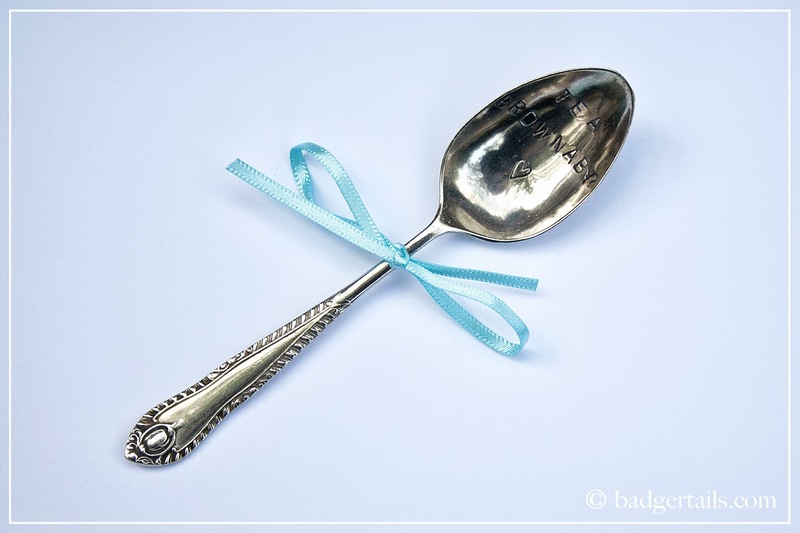 They're perfect for any occasion, but work beautifully for Anniversary, Christening and New Baby gifts. For your own handmade creation, head over to the lovely Victoria's Etsy shop. My second praise is for a very different, but equally as gorgeous item from the wonderful Daisy Bee Necklines. 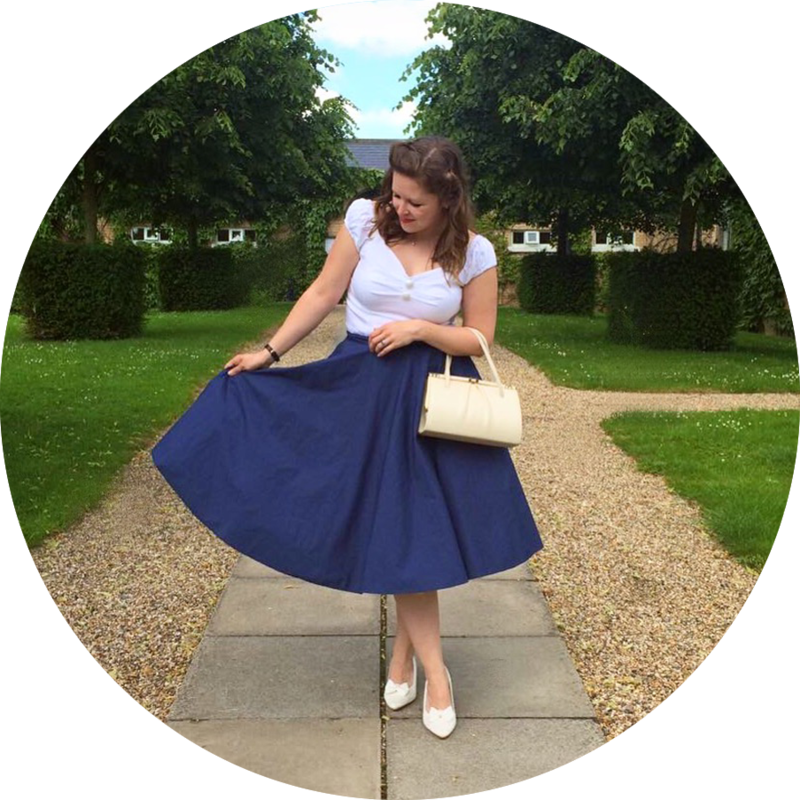 You can find her on Instagram as @daisy_bee_necklines, where she posts photos of orders and inspiration every day. 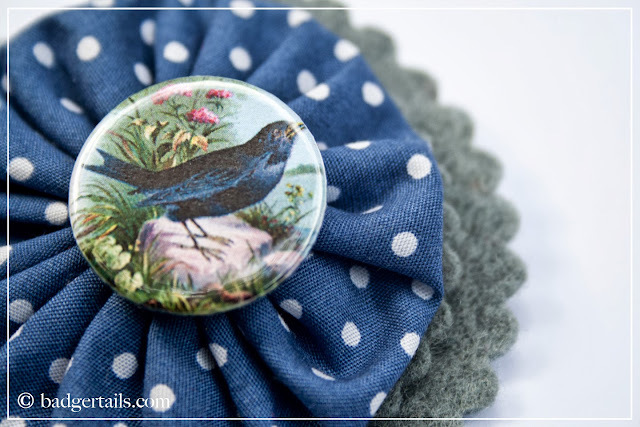 Daisy Bee handmakes 'bib' necklaces and brooches with vintage and retro fabrics. On this occasion I decided to opt for a brooch, as the rosette formations are just beautiful. 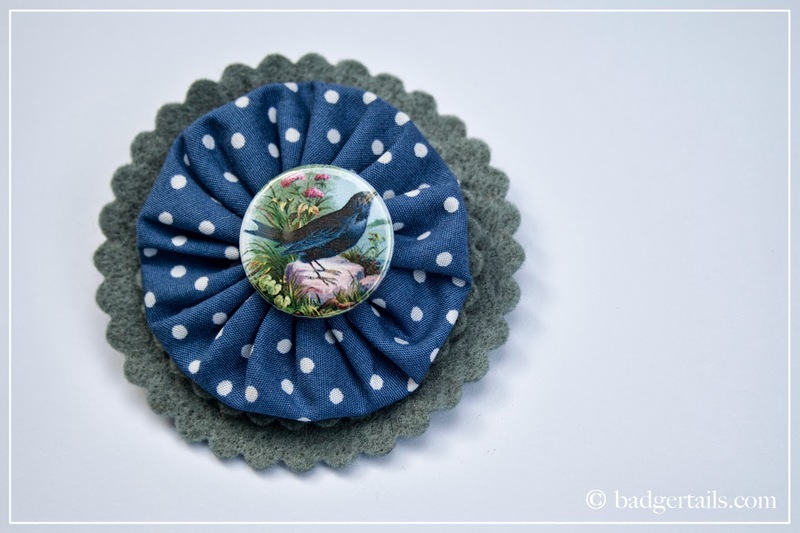 My order has ended up being a one-off, as Daisy Bee found just one of this blackbird button for me. She regularly uses Cath Kidston buttons for her brooches, and creates bib necklaces to compliment dresses made by Poppy Children, too. I must say, I am utterly in love with my brooch! The colours are just perfect and you can definitely feel the love and care that has gone into making it. Not to mention that blackbirds are very special to me, which makes this all the more priceless. If you're interested in Daisy Bee's creations, hop on over to her Instagram and let her know what colour combinations / button designs you love. 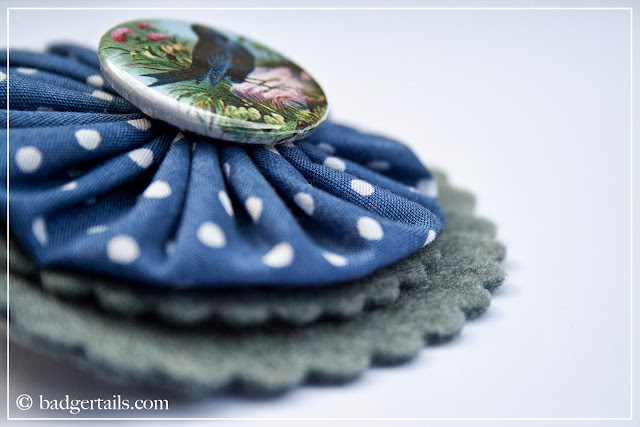 She worked with me to find the perfect button, then the perfect fabric combination and as a result I've got the most perfect brooch that makes me smile every time I see it. So I'd like to throw in a BIG thank you to Victoria and Daisy Bee for their exceptional and personal service, along with their simply beautiful products. 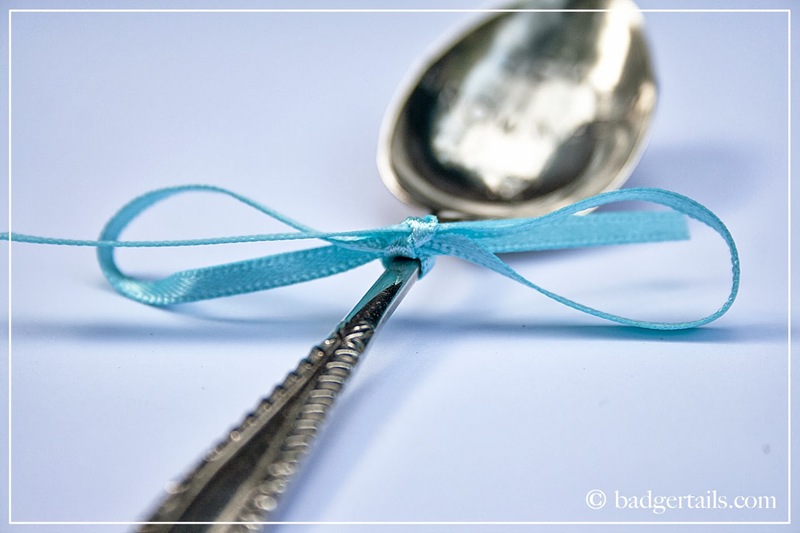 These items make great gifts, but also fab little treats for yourself too! I will no doubt be ordering more from them both in the future, seeing as I've already got things in mind for more treats!